This new innovative resource aims to give physiotherapy students and those new to respiratory care a simple, easy-to-use guide to the process and procedures used in the assessment of adult respiratory patients. 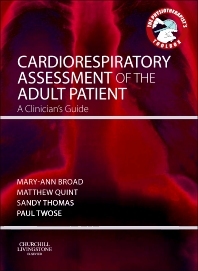 Cardiorespiratory Assessment of the Adult Patient begins by identifying the scope of respiratory physiotherapy and listing some key aims of assessment with an overview of different approaches. It then goes on to provide a selection of ‘assessment checklists’ for the main clinical settings which the physiotherapist is likely to encounter. Chapter 3 provides a selection of ‘assessment tools’ given alphabetically, including those that physiotherapists may be expected to carry out themselves and those where they only need to interpret the assessment findings. These tools include a systematic guide to the procedure involved (where relevant) and an explanation of the key findings and their significance for the physiotherapist. In the final section, individuals can apply their knowledge using case scenarios and suggested solutions are also provided.